The Government of Thailand has approved the acquisition of four Eurocopter EC725 Super Cougar medium multimission helicopters by the Royal Thai Air Force (RTAF) for conducting search-and-rescue (SAR) missions. RTAF official spokesman and group captain, Prapas Sonjaidee, said that an initial funding of THB4bn ($130m) has been allotted for the purchase, even though the contract is still under negotiations stage, reports IHS Jane. A total of 16 helicopters are expected to be purchased by the air force along with maintenance services and training support, to help replace its 40-year old fleet of Bell UH-1 Iroquois military helicopters. Deliveries under the contract are expected to be carried out in three phases. Phase two will involve supply of eight aircraft, while the remaining four helicopters are scheduled to take place under third phase, according to ThaiArmedForce.com. EC725 was selected against Sikorsky Aircraft’s S-92, AugustaWestland AW139 and the Russian-built Mil Mi-17 utility helicopters. Powered by two Turbomeca Makila 1A4 turboshaft engines, the EC725 Super Cougar is a long-range tactical transport helicopter designed for troop transport, casualty evacuation, combat search and rescue, maritime surveillance, humanitarian support, medical evacuation and shipborne operations. A derivative of Eurocopter AS 532 Cougar, the EC725 features a five-blade composite main rotor incorporating a new airfoil shape to lower vibration levels, and is capable of carrying up to 29 troops along with two crew members..
A search radar and forward looking infra red (FLIR) is present to provide day and night time search and rescue capability, alongside an anti-icing system to enable operation in extreme environments. The helicopters have been used by the French Air Force for evacuation purposes during Operation Baliste in Lebanon, and also during the Afghanistan conflict since 2007. 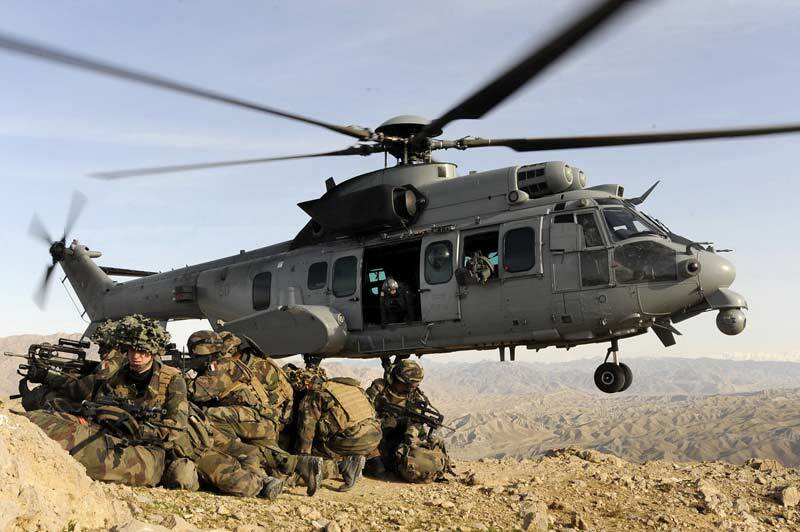 Image: An EC725 helicopter conducting operations in Afghanistan. Photo: courtesy of Wil94.